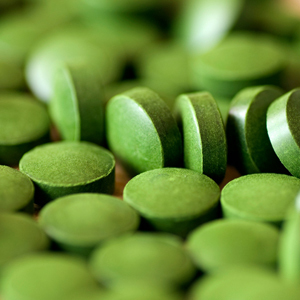 The name Chlorella derives from two Latin words meaning 'leaf' (green) and 'small', referring to the unusually high content of chlorophyll (the highest of any known plant) which gives Chlorella its characteristic deep emerald-green color. This particular fresh-water, single celled microscopic plant contains a host of health building nutrients. In addition to chlorophyll it contains vitamins, minerals, dietary fiber, nucleic acids, amino acids, enzymes, CGF (Chlorella Growth Factor) and other substances. Under the favorable growth conditions of strong sunlight, pure water and clean air, Chlorella multiplies at an incredible rate, the complete reproduction cycle taking less than 24 hours. Ingredients: 100% organic, pesticide free chlorella. Produced in Taiwan by The Taiwan Chlorella Manufacturing Co., Ltd., the world's largest producer of Chlorella Pyrenoidosa.